For months, JoJo Domann was a man with no name. While the rest of his teammates got a chance to show their new coaches what they could do, the sophomore safety was working in the shadows, rehabbing from consecutive ACL tears. Life was tough. Domann played in every game as a true freshman, recording eight tackles on special teams. Then, during spring ball, he tore his ACL for the first time. His surgery was on April 12, 2017. The injury kept him out of the rest of spring ball, fall camp and the entire 2017 season. After seven months of rehab, Domann was cleared for noncontact activites. For the sophomore from Colorado Springs, Colorado, that included basketball. The 6-foot-1, 225-pound linebacker was playing pick-up basketball in the rec center on campus and went up for a layup. He came back down and tore the ACL a second time. His surgery was on Nov. 6, 2017. After the second injury, Domann took a moment to re-evaluate things. Whatever he did, the coaches took notice. No longer was he a player without a name. Now in “hands down” the best shape of his life, both physically and spiritually, Domann has impressed the coaches enough to crack the two-deep at safety ahead of the 2018 season opener against Akron. Domann said he’s been working some at dime and at nickel linebacker, which he called their “cinco.” Domann just sees himself as a playmaker. “I envision myself making plays on Saturdays, making plays during the week, earning trust from the coaches and then just being able to play the game I love on Saturday,” Domann said. He’s already started making those plays in practice. 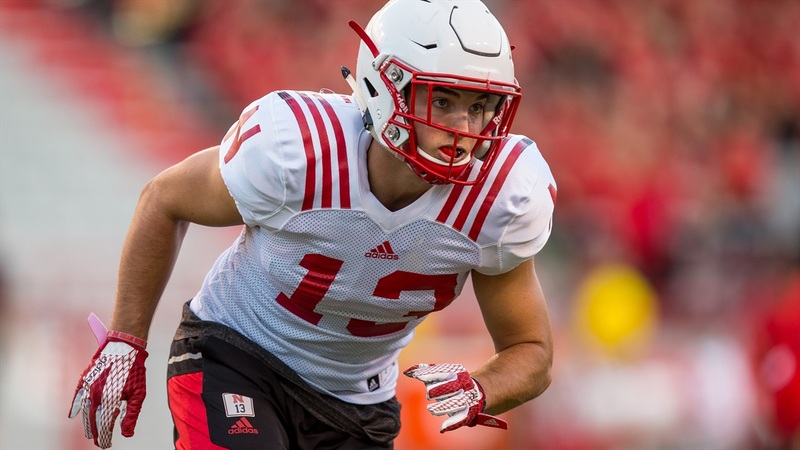 “I made a couple plays, but none of them had an exclamation point after them until I had an 87-yard pick-six the last day of fall camp and I think that was kind of the icing on top,” Domann said. The other players in that defensives backs room are fired up to see him flying around as well. Throughout all the adversity he’s faced during his young career, Domann’s desire to play football never wavered. Everything Domann has gone through has only served to deepen his love for football. On Saturday, after 17 months away from the game, Domann is going to be thrown back out into that storm against the Akron Zips.